Inhibits the synthesis of prostaglandins that may serve as mediators of pain and fever, primarily in the CNS. Has no significant anti-inflammatory properties or GI toxicity. Absorption: Well absorbed following oral administration. Rectal absorption is variable. Intravenous administration results in complete bioavailability. Distribution: Widely distributed. Crosses the placenta; enters breast milk in low concentrations. Metabolism and Excretion: 85–95% metabolized by the liver (CYP2E1 enzyme system). Metabolites may be toxic in overdose situation. Metabolites excreted by the kidneys. Half-life: Neonates: 7 hr; Infants and Children: 3–4 hr; Adults: 1–3 hr. Contraindicated in: Previous hypersensitivity;Products containing alcohol, aspartame, saccharin, sugar, or tartrazine (FDC yellow dye #5) should be avoided in patients who have hypersensitivity or intolerance to these compounds;Severe hepatic impairment/active liver disease. Use Cautiously in: Hepatic disease/renal disease (lower chronic doses recommended);Alcoholism, chronic malnutrition, severe hypovolemia or severe renal impairment (CCr <30 mL/min, ↑ dosing interval and ↓ daily dose may be necessary);Chronic alcohol use/abuse;Malnutrition; Obstetric: Use in pregnancy only if clearly needed (for IV); Lactation: Use cautiously (for IV); Pediatric: Neonates (safety and effectiveness not established) (for IV). Chronic high-dose acetaminophen (>2 g/day) may ↑ risk of bleeding with warfarin (INR should not exceed 4).Hepatotoxicity is additive with other hepatotoxic substances, including alcohol.Concurrent use of isoniazid, rifampin, rifabutin, phenytoin, barbiturates, and carbamazepine may ↑ the risk of acetaminophen-induced liver damage (limit self-medication); these agents will also ↓ therapeutic effects of acetaminophen.Concurrent use of NSAIDs may ↑ the risk of adverse renal effects (avoid chronic concurrent use).Propranolol ↓ metabolism and may ↑ effects.May ↓ effects of lamotrigine and zidovudine. Oral (Adults and Children >12 yr) 325–650 mg q 6 hr or 1 g 3–4 times daily or 1300 mg q 8 hr (not to exceed 3 g or 2 g/24 hr in patients with hepatic/renal impairment). 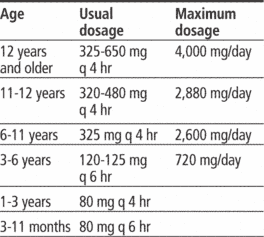 Oral (Children 1–12 yr) 10–15 mg/kg/dose q 6 hr as needed (not to exceed 5 doses/24 hr). 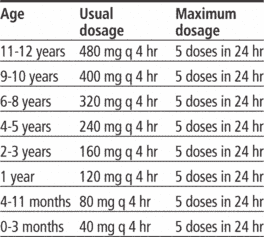 Oral (Infants) 10–15 mg/kg/dose q 6 hr as needed (not to exceed 5 doses/24 hr). Oral (Neonates) 10–15 mg/kg/dose q 6–8 hr as needed. Intravenous (Adults and Children ≥13 yr and ≥50 kg) 1000 mg q 6 hr or 650 mg q 4 hr (not to exceed 1000 mg/dose, 4 g/day, and less than 4 hr dosing interval). Intravenous (Adults and Children ≥13 yr and <50 kg) 15 mg/kg q 6 hr or 12.5 mg/kg q 4 hr (not to exceed 15 mg/kg/dose, 75 mg/kg/day, and less than 4 hr dosing interval). Intravenous (Children 2–12 yr) 15 mg/kg q 6 hr or 12.5 mg/kg q 4 hr (not to exceed 15 mg/kg/dose, 75 mg/kg/day, and less than 4 hr dosing interval). Intravenous (Infants and Children <2yr) 7.5–15 mg/kg/dose q 6 hr (not to exceed 60 mg/kg/day). Rectal (Adults and Children >12 yr) 325–650 mg q 4–6 hr as needed or 1 g 3–4 times/day (not to exceed 4 g/24 hr). Rectal (Children 1–12 yr) 10–20 mg/kg/dose q 4–6 hr as needed. Rectal (Infants) 10–20 mg/kg/dose q 4–6 hr as needed. Rectal (Neonates) 10–15 mg/kg/dose q 6–8 hr as needed. In combination with: many other medications. See combination drugs. Assess overall health status and alcohol usage before administering acetaminophen. Patients who are malnourished or chronically abuse alcohol are at higher risk of developing hepatotoxicity with chronic use of usual doses of this drug. Assess amount, frequency, and type of drugs taken in patients self-medicating, especially with OTC drugs. Prolonged use of acetaminophen increases the risk of adverse renal effects. For short-term use, combined doses of acetaminophen and salicylates should not exceed the recommended dose of either drug given alone. Do not exceed maximum daily dose of acetaminophen when considering all routes of administration and all combination products containing acetaminophen. Pain: Assess type, location, and intensity prior to and 30–60 min following administration. Fever: Assess fever; note presence of associated signs (diaphoresis, tachycardia, and malaise). Lab Test Considerations: Evaluate hepatic, hematologic, and renal function periodically during prolonged, high-dose therapy. May alter results of blood glucose monitoring. May cause falsely ↓ values when measured with glucose oxidase/peroxidase method, but probably not with hexokinase/G6PD method. May also cause falsely ↑ values with certain instruments; see manufacturer’s instruction manual. Increased serum bilirubin, LDH, AST, ALT, and prothrombin time may indicate hepatotoxicity. If overdose occurs, acetylcysteine (Acetadote) is the antidote. Do not confuse Tylenol with Tylenol PM. To prevent fatal medication errors ensure dose in milligrams (mg) and milliliters (mL) is not confused; dosing is based on weight for patients under 50 kg; programming of infusion pump accurate; and total daily dose of acetaminophen from all sources does not exceed maximum daily limits. When combined with opioids do not exceed the maximum recommended daily dose of acetaminophen. Oral: Administer with a full glass of water. May be taken with food or on an empty stomach. Intermittent Infusion: For 1000 mg dose, insert vented IV set through septum of 100 mL vial; may be administered without further dilution. For doses <1000 mg, withdraw appropriate dose from vial place in a separate empty, sterile container for IV infusion. Place small volume pediatric doses up to 60 mL in a syringe and administer via syringe pump. Solution is clear and colorless; do not administer solutions that are discolored of contain particulate matter. Administer within 6 hrs of breaking vial seal. Rate: Infuse over 15 min. Monitor end of infusion in order to prevent air embolism, especially if acetaminophen is primary infusion. Additive Incompatibility: Do not mix with other medications. Advise patient to take medication exactly as directed and not to take more than the recommended amount. Chronic excessive use of >4 g/day (2 g in chronic alcoholics) may lead to hepatotoxicity, renal or cardiac damage. Adults should not take acetaminophen longer than 10 days and children not longer than 5 days unless directed by health care professional. Short-term doses of acetaminophen with salicylates or NSAIDs should not exceed the recommended daily dose of either drug alone. Advise patient to avoid alcohol (3 or more glasses per day increase the risk of liver damage) if taking more than an occasional 1–2 doses and to avoid taking concurrently with salicylates or NSAIDs for more than a few days, unless directed by health care professional. Inform patients with diabetes that acetaminophen may alter results of blood glucose monitoring. Advise patient to notify health care professional if changes are noted. Caution patient to check labels on all OTC products. Advise patients to avoid taking more than one product containing acetaminophen at a time to prevent toxicity. Advise patient to consult health care professional if discomfort or fever is not relieved by routine doses of this drug or if fever is greater than 39.5°C (103°F) or lasts longer than 3 days. Pediatric: Advise parents or caregivers to check concentrations of liquid preparations. All OTC single ingredient acetaminophen liquid products now come in a single concentration of 160 mg/5 mL. Errors have resulted in serious liver damage. Have parents or caregivers determine the correct formulation and dose for their child (based on the child's age/weight), and demonstrate how to measure it using an appropriate measuring device. Relief of mild to moderate pain. A brand name for PARACETAMOL. Potential licensees in the beauty accessories industry are currently being targeted as candidates to eventually commercialize the Tempra Brow on a worldwide basis. FIAT FANATIC: Gabrielle Funaro, left, collects the Fiat Tempra from Scally Rally competitors Dean Winter and Lee Taylor, right. Mercedes works mostly with paints--acrylics and tempra. La problematica de la reforma leo gal de los medios de informacion y la construccion de un nuevo modelo de comunicacion colectivo, ahora esta posicionado con mayor visibilidad en la agenda nacional como un problema politico colectivo que, tarde o tempra no, debera ser encarado definitivamente por los gobiernos en turno que buscan la transicion a la democracia nacional. UWM will be an autonomous organization within The Wine Group, and feature brands such as Pinot Evil (France), Killer Juice (Central Coast), Silverbirch (New Zealand), Herding Cats (South Africa), Grizzly Flat (Lodi), Tempra Tantrum (Spain), Rhineflur (Germany), Angel Juice (Italy), and Devil's Marbles (Australia). L'Accademico e vaghissimo Pittore signor Bagliani s'attenne minutamente a' miei metodi, ne' quali, secondo che mi diceva, trovava de' pregj inestimabili; ma nel terminare le dilicate carnagioni desiderava la maniera d'impastare propria dell'olio, e si vedeva costretto a ridurle tratteggiando: intanto tutti sono testimonj del Ritratto che fece d'una sua piccola Figlia ohremodo gajo e bello, pel quale il signor Bagliani confessava, che certi drappi di seta, e certi pizzi bianchi non li sapeva fare cosi belli ne ad olio, ne alla tempra ordinaria, ne a sola gomma, e che restava sorpreso della speditezza e nettezza del lavoro degli encausti. Este efecto se atribuye al envejecimiento de la poblacion, a las campanas desarrolladas para el screening y mediante la tecnica de deteccion tempra na del Antigeno Prostatico Especifico (PSA). Datamonitor reports that Crown Cork & Seal has been working with a company called Tempra, which specializes in self-cooling packages, in developing a self-chilling beer can for a brewer in the UK. Tempra Technology of Bradenton, FL and Crown together are the leaders in self-cooling technology and its proprietary self-refrigerating technology uses the evaporation of water into a vacuum to produce its Instant Cool Can. BOL-59, BOL-89, BOL-98, BUR, JUL, JULCAT, M-395, M-478, MEV-095, MEV-150, P-HIERRO, PROLE, QBLANCO, RIVERO, TEMPRA, UCV-2105 y UCV-2184; el segundo de los grupos lo forman las entradas AMA-134, BAR-1, BRA-12, M-278, M-306, M-365, M-366, M-433, M-434, PASTO, REMIGIO y UCV-2129; el tercero las entradas M-285, M-292, M-327, M-338 y M-394; y el cuarto grupo esta formado por las entradas AMA-135, AMA-166, AMA-168, BOL-50, BOL-60, CHAPA, COGO, L-PAJA, M-279, M-284, M-291, M-307, M-388, M-392, M-393, M-402, M-422, M-440, M-479, MEV-061, MEV-180, MEX-59, MORI, UCV-2062 y UCV-2076. THE boxy Fiat Tipo doesn't win any beauty contests and its Tempra saloon brother isn't much better looking, but both offer class-leading interior space. At George Marston Road, in Ernesford Grange, the thieves took the keys to a Fiat Tempra, registration number L302 DJX.